You know its your birthday when you pick up a Synology DS716+ NAS Server for under £200, well £188 from Amazon in the Lightening Sale. I own a few Synology units (current set up to the right) and have owned various others dating back to 2010/2011 and for the most part they are spectacularly good. 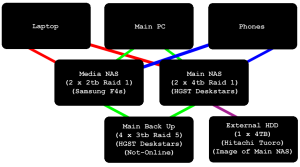 I re-purpose the older units within my network, the oldest is a DS211+ currently the Media NAS. The newest is the External Hitachi Touro HDD which does a weekly image of the Main NAS. I did want to buy an 8 Bay NAS to Raid 6 it, but this were a killer deal. 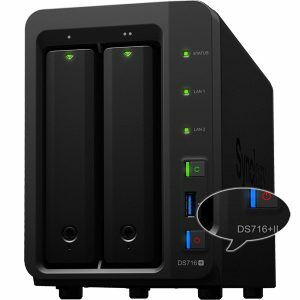 This particular model (DS716+) has been replaced with the Synology DS716+II, so it were EOL (End of Lined) or Discontinued hence the price. There has been a little speculation as why they updated the model to the Mk2 (II) given the lack of serious updates. Some have speculated that Synology maybe taking their lead from other NAS players in the market who release multiple versions of the same NAS with different specs. They currently already do this, but I don’t buy that as reason here, lets look at the DS216 which does have various flavours. DS216 SE Marvel Single Core 800mhz, 256mb DDR3 (Buy Here £103.04). DS216 J Marvel Dual Core 1.0ghz, 512mb DDR3 (Buy Here for £129.44). DS216 Play STM Dual Core 1.5ghz, 1gb DDR3, +HW Encoder, +Transcoder (Buy Here for £191.99). DS216 Marvel Dual Core 1.3ghz, 512mb DDR3, Hot Swappable, USB Clone, Upgradable Ram, Released Feb 2015 (Buy Here for £213.99). DS216+II Intel Dual Core 1.6ghz, Burstable 2.48ghz, 1gb DDR3, +HW Encoder, +Hot Swappable, +USB Clone, +eSATA Port, Upgradable Ram, Released June 2016, (Buy Here for £259.94). You can see the spec changes and price point between flavours is quite dramatic, just looking the DS216 and DS216+II and the change is huge, now lets look at the DS716+I and DS716+II. Everything else is nigh on identical, as best I can tell it is identical apart from the little print (shown on the right). In all likelihood that’s the same chip just modified a touch by Intel. I tend to agree with the few who say due to the stellar success of this model (and the chip), it exhausted the chips availability thus Intel discontinued the chip and brought forward the next iteration and thus opening a new stockpile of chips. I always choose hard drives carefully, after having been burned quite badly simply by choosing the cheapest big brand (begins with S). So for the last 6yrs maybe 7 yrs with spinning drives I have always run HGST Deskstars (I briefly used Samsung F4’s too) and not had a single disk failure. Its quite ironic that back in the day around the late 1990s and early 2000s, I were around when IBM Deathstars were vaporising into dust. IBM Deskstars and Travelstars (along with its HDD business) were sold to Hitachi in 2003 who turned it around quite dramatically. This is an interesting post, showing a tear down of a deathstar. Hitachi were then bought out by Western Digital (WD) who appear to have used Hitachi Magic to improve their WD Red NAS Drives, rather than degrade Hitachi’s Legacy. 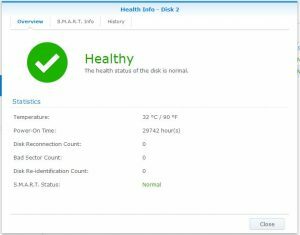 The above image is one of my retired Hitachi Deskstars (before the HGST rebrand), this batch ran continuously in a 2 Bay NAS then into a 4 bay Synology NAS before being retired. This were the final disk to be replaced on my replacement cycle hence its a few months overdue a refresh. After 3 years, 4 months, 3 weeks and 3 days continuous operation not a single error or bad sector. All the others are similar, no errors, no bad sectors, nothing but perfect service.